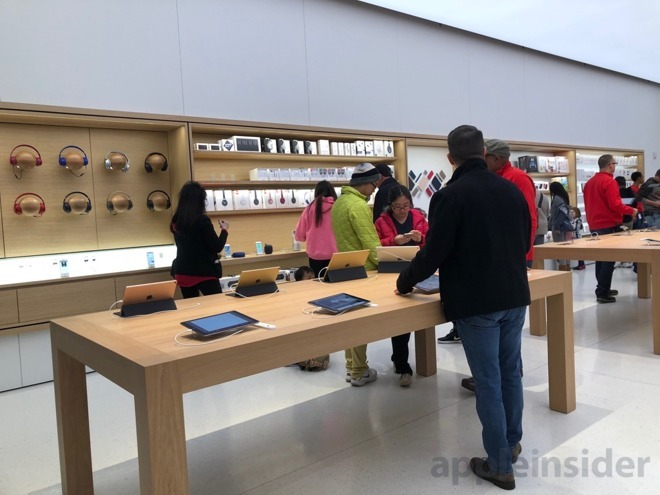 Apple on Saturday held a grand opening for a newly relocated retail store in Raleigh, N.C.'s Crabtree Valley Mall, replacing an outlet that first opened more than ten years ago. 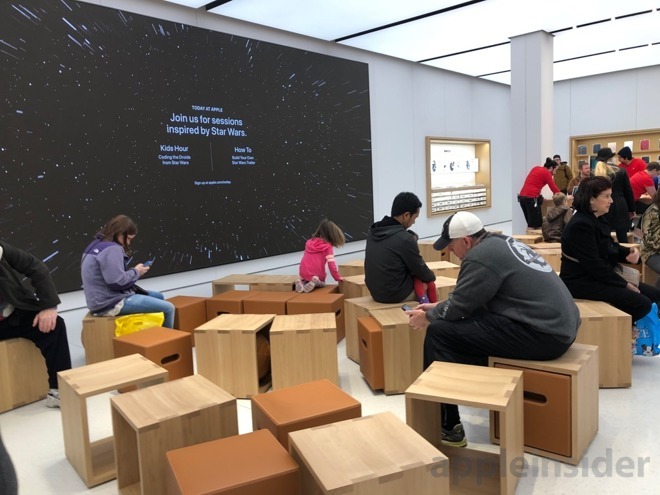 The new location occupies nearly twice as much space as the old store, and features the usual trappings of a next-generation Apple "town square" with floor-to-ceiling video display, cube-shaped seats and plenty of wood. Gone are the old-style black and white shelves, or peg boards, that housed accessories like audio equipment. 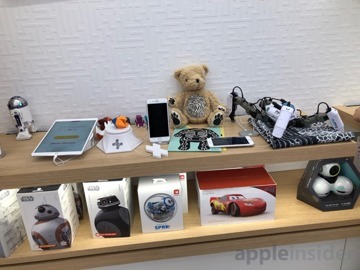 Like other new and newly renovated Apple stores, the Crabtree Valley Mall location now boasts custom-built furniture highlighting toys that work with Swift coding, health and fitness products, HomeKit devices and more. Headphones get their own wooden shelves at eye level, speakers have two shelves at knee height and Mac accessories sit on a white bookshelf. Lighting embedded in the store's ceiling illuminates a wide-open sales floor, on which stands a few Jony Ive-approved wooden display tables showing off iPhone, Mac, Apple Watch and iPad. Geniuses and creatives, the latter of which run Today at Apple sessions, get their own workbenches at the back of the store. 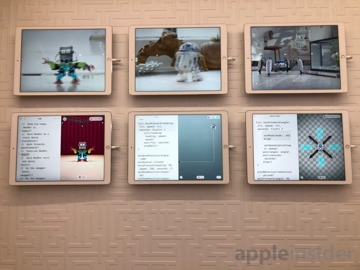 Currently, an array of six iPad Pros is installed in one of the store's nooks, highlighting Swift Playgrounds coding with the Sphero Star Wars Droids, Beasts of Balance, Tangram and other iOS-connected toys are out to be played with. In another area, two TV screens run a demonstration of HomeKit accessories and an Apple TV 4K. 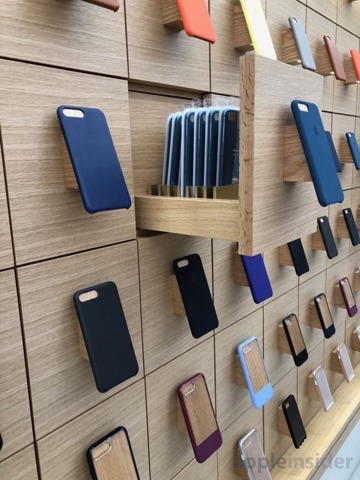 Device cases, like the new iPhone X leather folio, are displayed on wooden iPhone-shaped stands that act as handles for drawers in which the products are held. 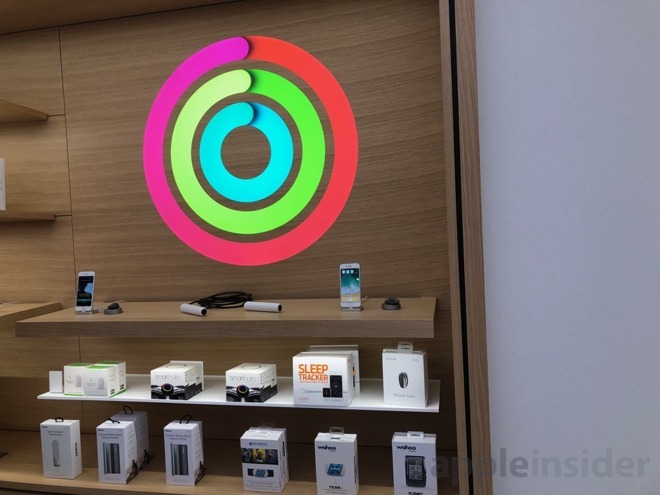 iPad Pros are used in other areas of the store, like the Health and Fitness section, which has signage like the Activity rings of an Apple Watch. 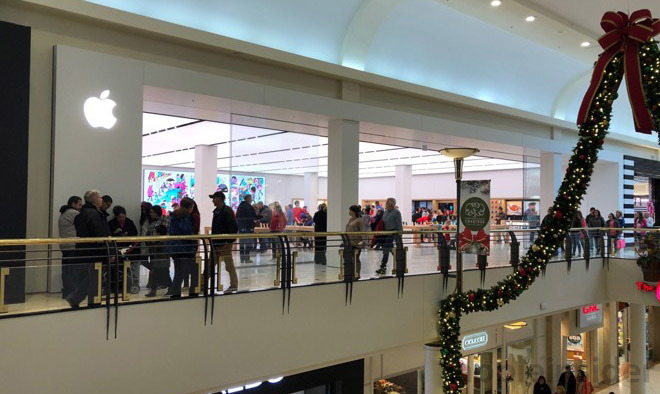 The new Raleigh store mirrors other in-mall Apple stores not located near major city centers. Compared to the shops around it, the outlet is clean, bright, well-staffed and has lots of space for product browsing and self-education. 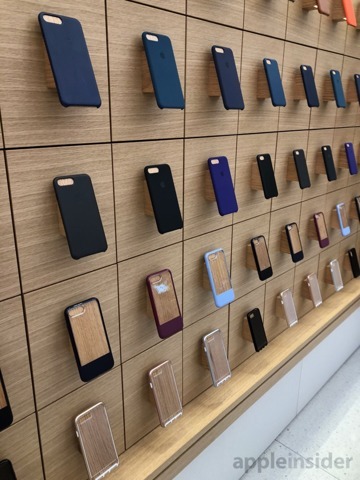 As Apple continues to build big and flashy international flagship stores, the company's U.S. retail team focuses on relocating and renovating a well-established chain of outlets. Recent activity includes the reopening of renovated stores in Burlingame, Calif., and Burlington, Mass., and construction work on a relocated shop in Seattle's University Village Mall. In October, Apple opened the doors to a new Chicago flagship that sports a grand staircase, glass walls and metal roof. 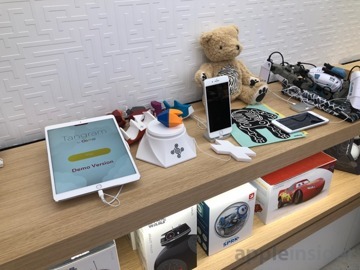 Most recently, AppleInsider got a sneak peek at the tech giant's futuristic Downtown Brooklyn outlet, which opened to the public last week.